The Trimble® CU controller is an advanced detachable control unit especially designed for Trimble optical and GPS surveying systems*1*. On its Windows® CE.Net operating system, the Trimble CU controller runs your choice of powerful Trimble field software*2*, plus other specialized Windows software as needed. Every innovative feature on the Trimble CU controller is designed to make your job easier. Clearly view background maps and check work on the color graphic display for greater data control and confidence. The 1 GB of memory lets you take all your base data (point lists, background maps) into the field. Access frequent functions via dedicated instrument control keys. Quickly select software options using the touch screen. Eliminate the hassle of cables and expedite setup with integrated Bluetooth® wireless technology. When the Trimble CU controller is used on an instrument such as the Trimble R6 or Trimble S6 rover, the system is 100% cable free for unsurpassed convenience and ease of use. Choose the method of data transfer that suits your situation. Using an external modem such as a cellphone with Bluetooth, you can send and receive files over the Internet while in the field: you don’t need to drive back to the office. When in the office, the Trimble CU docking station provides fast data transfer to your computer. The Trimble CU also provides USB and serial communication options. Data can be transferred to a PC or another Trimble CU using a cable, Bluetooth, a CompactFlash Card reader, or a USB memory device. The Trimble CU controller is rugged enough for any job in any weather. It holds an environmental rating of IP55 and operates in extreme temperatures of –30 ºC to +55 ºC (–22 ºF to +131 ºF). It can also withstand a pole drop of 1.0 m (3.3 ft) onto a hard surface. The display and keyboard are illuminated, so you can finish any job fast even in low lighting. The Trimble CU controller receives power from the optical instrument or the especially designed holder, which attaches to a robotic or GPS rover pole. The Trimble CU controller is central to Integrated Surveying from Trimble. With software such as the Trimble Survey Controller™ software onboard, collect GPS and optical data in one Job file simply by switching the Trimble CU controller between sensors. Standardize on one flexible controller for maximized investment. And your survey team only needs to know one interface. When field work is complete, simply transfer the Job file to your office using the communication method that suits. A surveyor’s work flow has never been easier. *1* The Trimble CU Controller is designed to support Trimble’s latest surveying systems, including the Trimble R8 GNSS System, Trimble S6 Total Station, Trimble S8 Total Station, and Trimble VX Spatial station. The Trimble CU also supports the Trimble 3600/5500/5600 optical instruments via the Trimble CU Adapter. 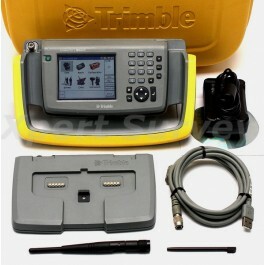 *2* The Trimble CU Controller runs the Trimble Survey Controller software. In addition, a number of regional solutions are available. For more information on the field software that’s best for you, talk to your local Trimble Authorized Distribution Partner. Software The Trimble CU controller runs the Trimble Survey Controller software. In addition, a number of regional solutions are available. For more information on the field software that’s best for you, talk to your Trimble Authorized Distribution Partner. Certification Class B Part 15 FCC certification, CE Mark approval and C-tick approval. Bluetooth type approvals and regulations are country specific.